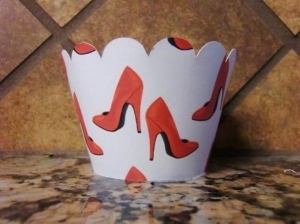 Designed especially for Diva Entertains - our shoe cupcake wrappers will instantly dress up any place setting or dessert table! 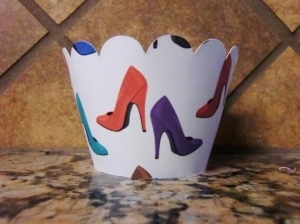 And, if you would prefer that your wrapper only have one color of shoe on it - just tell us! These cupcake wrappers are not for baking. They are used for display only. Our cupcake wrappers have a tabbed end that fits into a slit on the other end; very easy to put together although we also include a 'how to sheet' (you can also tape them together). Wrappers measure 2 1/4" to the top of the scallop. Please allow us up to 7 business days to fulfill your order; then add ship time.